The DOJ, now overseen by Jeff Sessions, is walking back years of effort aimed at limiting the harmful effect of state voter ID measure on minorities. After arguing for nearly six years that Texas’ voter ID law intentionally discriminated against minorities, the U.S. Department of Justice has informed the other plaintiffs in the case it has abandoned that position. The decision comes one day before the DOJ and the other plaintiffs were scheduled to make their latest arguments against the ID law. “I think it is clearly a retreat from voting rights,” said Danielle Lang, deputy director of voting rights for The Campaign Legal Center, which represents plaintiffs in the case. She said her organization has been “raising alarm bells” about new Attorney General Jeff Sessions’ willingness to protect voting rights since he was nominated. Still, today’s decision disturbed her. The DOJ declined comment. There is no indication that the DOJ plans to withdraw its argument that the Texas law was discriminatory in its effects. 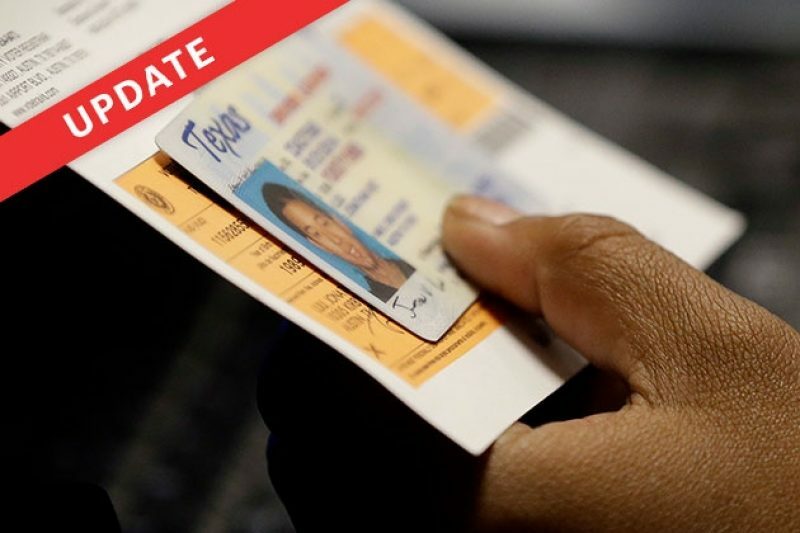 Texas’ voter ID law was passed in 2011, but put on hold after the Justice Department intervened. When the Supreme Court limited the scope of the Voting Rights Act in a 2013 decision, Texas put the law into immediate effect. Texans were required to show one of seven forms of government-issued photo ID at the polls in local, statewide and federal elections. But the law, known as SB 14, was rolled back for the November 2016 election, largely because of the DOJ’s success in arguing the law was discriminatory in intent and effect. The high court lets stand the findings of lower courts that the strict Texas ID measure discriminated against minorities. Read the story. In a scathing 147-page ruling in October 2014, U.S. District Judge Nelva Gonzales Ramos of Corpus Christi wrote, “The Court holds that SB 14 creates an unconstitutional burden on the right to vote, has an impermissible discriminatory effect against Hispanics and African-Americans, and was imposed with an unconstitutional discriminatory purpose.” Her ruling was stayed, pending appeal. In July 2016, the Court of Appeals for the Fifth Circuit in New Orleans — widely considered the most conservative appeals court in the country — upheld Ramos’ ruling that the law had a discriminatory impact on minorities. Minorities and the poor, the appeals court said, were less likely to possess the type of ID required by the law, and the state’s “lackluster” education campaign did little to prepare voters for the changes. But the Fifth Circuit declined to rule on whether the law had been intentionally written to discriminate against minorities, asking Ramos to reconsider this issue. This is at issue in tomorrow’s hearing. The Fifth Circuit also asked Ramos to create a temporary solution to the law’s discriminatory effect, to be in place by the November election. Shortly before the November election, Texas and the plaintiffs reached an agreement to allow voters to fill out a waiver if they did not possess one of the seven forms of government-issued photo IDs required by the law. More than 164,000 Texans signed this affidavit during the November election, though an analysis by the Associated Press found that at least 500 Texans voted through an affidavit even though they possessed one of the necessary forms of ID. This compromise will stay in place until a permanent solution is reached, which the Texas legislature hopes will be during this legislative session. It is now considering a bill that would essentially lock the compromise in place, and impose high criminal penalties of between two and 10 years in prison for lying on the affidavit. Lt. Gov. Dan Patrick has made the legislation a “priority,” which allows it a faster track. Speculation began that DOJ might reverse its long-held position in the case only hours after President Donald Trump was inaugurated. On Jan. 20, lawyers for the DOJ requested that oral arguments regarding the law’s intent be postponed in order to “brief the new leadership of the Department on this case and the issues to be addressed at that hearing before making any representations to the Court.” Ramos granted that postponement, scheduling the arguments for Feb. 28. Then, shortly after Trump was inaugurated, Thomas Wheeler was appointed acting head of the DOJ’s civil-rights division. The division oversees the DOJ’s implementation of federal law on voting, and Wheeler’s appointment was another sign of the Trump administration’s intention to switch sides. Wheeler is a strong proponent of voter ID laws and served as counsel to Vice President Mike Pence when Pence was the governor of Indiana. He served as the chairman of the Indiana Election Commission from 2005 to 2010, during which time the state instituted its own voter ID law. The Huffington Post reported Wheeler personally offered advice to Texas lawmakers while Texas’ law was being crafted. Last week, the DOJ again requested a postponement, jointly filing a request with the state of Texas arguing the hearing be delayed until after the legislature had a chance to consider the bill updating the voter ID law. “If new Texas state voter identification legislation is enacted into law, it will significantly affect the remainder of this litigation,” the DOJ and Texas jointly argued. “The question at hand is whether or not the law that was passed in 2011 was racially discriminatory, and anything done in 2017 cannot change the facts from 2011,” said Lang. The DOJ had previously argued exactly that. In August, when the state originally sought to postpone arguments regarding intent until the legislature had time to come up with a solution, Lang said the DOJ fought back, arguing it was in the interest of justice to resolve the matter as quickly as possible. Tomorrow’s hearing will still go forward as planned, as the DOJ was not the only plaintiff in the case. Lawyers for the remaining plaintiffs, which include U.S. Rep. Mark Veasey and several voters negatively impacted by the law, will continue to argue that the state intentionally discriminated against minorities.